The United Nations Office for Disaster Risk Reduction (UNISDR) and its partners launched on Monday an online survey to assess how persons with disabilities cope with disaster events. The survey will also focus on issues such as the ability to protect oneself and having sufficient time to evacuate before a potential disaster, and gauge knowledge, awareness and participation in disaster management plans at national and local levesl. The accumulated data can help governments adequately prepare plans for assisting persons with disabilities in times of extreme need. “The survey will focus on a major blind spot in disaster management, the needs of the 1 billion or more people estimated to live with some form of disability,” said Margareta Wahlstrom, the UNISDR Special Representative. “We can expect that as many as 30 million people living with a disability are affected during an average year by earthquakes and weather-related hazards,” she said. The survey comes after the three-day sixth session of the Conference of the States Parties to the Convention on the Rights of Persons with Disabilities at UN Headquarters in New York which examined ways to improve conditions and employment opportunities around the globe. The UN estimates that 80 per cent of people with disabilities face considerable challenges in their daily lives, and are more susceptible to be living in poverty. The UN Convention was adopted by the General Assembly on December 13, 2006 and was ratified by most countries on May 3, 2008. 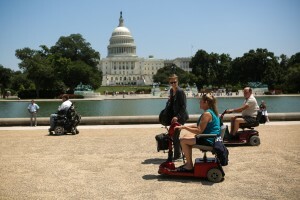 On July 25, a coalition of leaders from the disability community, civil rights organizations and veterans’ groups held a rally near the Capitol in Washington urging Congress to ratify the UN Convention on the Rights of Persons with Disabilities. The results of the online survey will be announced on October 13, 2013 – the International Day for Disaster Risk Reduction.